The opening chapter of Forged With Flames seems as timeless as our continent's contention with bushfire and as immediate as this summer's smoky ruins. It doesn't matter that it tells the events of Ash Wednesday, 1983, because it could be happening to someone, somewhere - today. I read this chapter in the midst of a busy day and at the end had to take a few moments to collect myself. Ann Fogarty, with the assistance of Anne Crawford, tells what happens when "a massive fireball" leaping ahead of a raging bushfire heads straight toward her and her children. I could see an entire movie being made from this one chapter. Perhaps it is the kind of telling only possible so many years later and that is true of much of the rest of the book which is intensely personal and would not be easy to write without the passing of time. It is a well-written book that ensures not only the compelling action scenes, but also the ebb and flow of an entire life, are engaging and fulfilling. The cover material for Forged With Flames carefully side-steps the exact nature of Ann's experience on this fateful day and so I will follow that lead and say no more. Only to remind you that 75 people died in the Ash Wednesday fires. Ann could easily have been one of them. How individuals, families and communities recover from tragedy - especially the levelling of entire landscapes - is an issue all too relevant for our nation, and many others. Ann's story will provide inspiration, insight and reason to believe that life can begin again, that we can come through almost anything. Some of this 'coming through' is aided by the heroics of emergency responders, also from the kindness and skill of the caring professions. Amazing acts of friendship, resilience of spirit and a rigorously-tested but responsive faith in God all play their part. Laughter greeting the loss of half an ear, famous flautists telling stories of being too drunk to sit in a wheelchair, letters arriving from pop stars half a world away and strangers who stand watch every night for months, are all part of why Ann is still with us, and sharing her story. 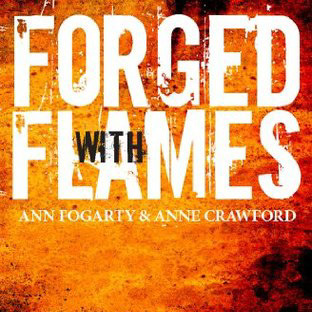 Of Ann Fogarty I will say no more - read her story in Forged With Flames. Writer Anne Crawford is known to us for co-authoring two previous titles, Shadow of a Girl (Penguin 1995) and Doctor Hugh, My Life With Animals (Allen & Unwin, 2012). Forged With Flames, paperback 260 pages, published by Wild Dingo Press, February 2013, $24.95. To purchase now, click on the Booktopia advertisement below to be taken directly to Forged With Flames.